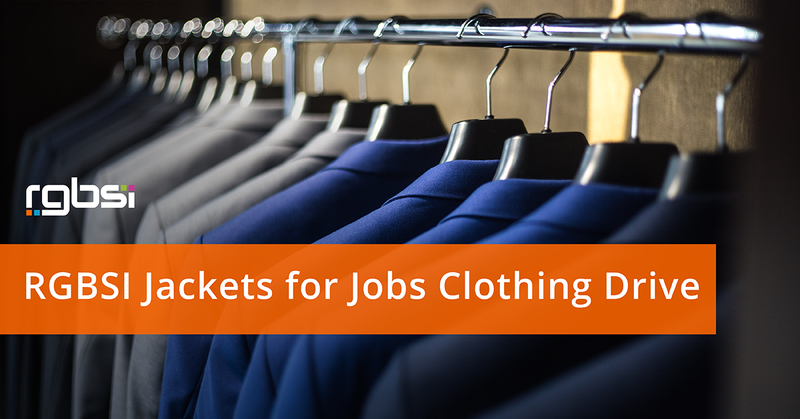 The RGBSI team is excited to partner with Jackets for Jobs, Inc in its mission to provide all job seekers with access to professional clothing attire. In addition to providing impressionable clothing for those in need, Jackets for Jobs offers career skills training and interview coaching to help job seekers achieve their goals. People who are in dire financial need find themselves in a terrible predicament. They want to work, but they can't get a job because they are unable to buy the right clothing to wear to job interviews. We all have those clothes in the back of our closets that we never touch, maybe some suits and business clothing. Instead of having these items take up space in your closet or tossing them in the trash, consider donating new or gently used items to an organization that will give them to people who can't meet the expense of purchasing new job interview and work attire. We will be hosting a clothing drive to collect donations in support of this cause and welcome ANYONE to participate. We will collect lightly used professional clothing items, shoes, and accessories of all sizes. Donations on hangers are helpful and welcomed. We appreciate all generous contributions. At RGBSI, we provide engineering, IT, and administrative job opportunities for contract, contract to hire, project based, and permanent positions. We have established relationships with top companies in engineering and IT industries around the globe. The opportunities are endless for engaging in different career paths.